When it comes to large groups, vacation time can be a lot like dinner time: People all have different tastes and preferences. At the following ski resorts, you can rest assured that there will be something for everyone. 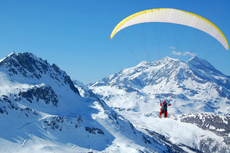 From dogsledding to paragliding, there's an activity for the most and least adventurous members of your cold-weather entourage.